The sandwich ELISA is a type of Enzyme-linked immunosorbent Assay that uses two antibodies: a capture antibody and a detection antibody. The purpose of any ELISA is to detect the presence of a target antigen in a sample. In a sandwich ELISA the target antigen is bound between a capture antibody and a detection antibody. 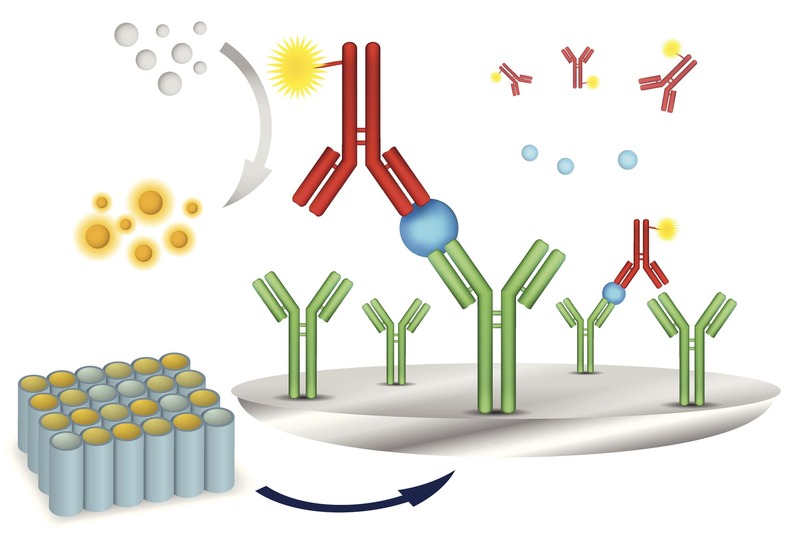 The capture antibody is immobilized on a surface, while the detection antibody (conjugated to an enzyme or fluorophore label) is applied as a last step before quantitation. The two antibodies used in a sandwich ELISA must be paired and tested before use. This means that they are known to bind to different places on the target antigen. It is very important that the capture antibody and the detection antibody don't interfere with each other's binding capability. Coat a surface with capture antibody. This surface can be a multi-well plate or a mobile surface such as a magnetic bead. The purpose of this is to reduce background and nonspecific binding. Blocking buffers are typically made of proteins such as bovine serum albumin (BSA), casein, or serums like fetal bovine serum (FBS). These are inexpensive and readily available proteins that will adsorb to the polystyrene, which in turn prevents the target from adsorbing to the polystyrene. Add the substrate and measure any chromogenic, chemiluminescent, or fluorescent readout from the enzyme-substrate interaction or excited fluorophore. If using magnetic beads as a solid support system they may be collected using magnetic separation prior to this step in order to improve signal intensity. If the target antigen is present in the sample then the detection antibody will bind to it and the linked enzyme will be able to act on the substrate and a signal will be produced. This signal can be a simple color change (chromogenic) or light-producing (chemiluminescence). The signal produced is directly dependent on the enzyme-substrate pair used for detection. Of course, if the antigen is not present in the sample, then the enzyme-linked detection antibody will not have anything to bind to and no signal will be produced. In the case of a fluroescence ELISA, the detection antibody will not be labeled with an enzyme, but will instead be labeled by a fluorophore. A flurophore emits light after it is excited by incident light. So, enzyme-substrate labels produce light or color as a result of the chemical interaction of the enzyme and substrate, but fluroescent labels require incident light in order to excite the electrons of the fluorophore into a higher energy state from which they can release energy and emit light. An ELISA reader is a versatile instrument that can be used to detect any of these labels, so a variety of labels are available and simple to use in sandwich ELISAs. There are two very popular chromogenic enzymes used for ELISA assays: Horse radish peroxidase (HRP) and alkaline phosphatase (ALP). HRP catalyzes the cleavage of its substrate hydrogen peroxide in the presence of a hydrogen donor to produce a color change. ALP catalyzes the color change of P-Nitrophenyl-phospate (pNPP). The chromogenic sandwich ELISA can be quantified by measuring absorbance. Many chemiluminescent and fluorescent enzyme-substrate pairs are also commercially available and they require fluorimeters or luminometers for quantification.